Get 35% OFF H&R Block Basic is now 35% off at HRblock.com. 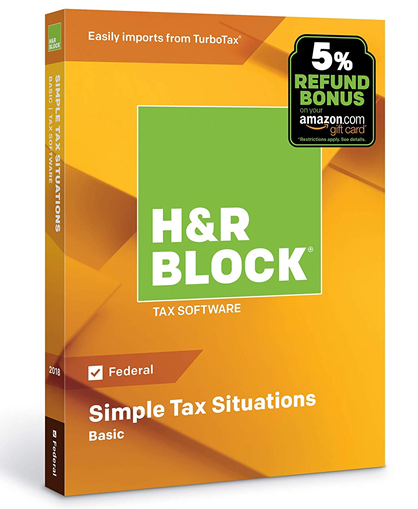 We just received this instant offer from the folks at H&R Block: Save 35% on your boxed software order when you use the above coupon link and order directly from the HRBlock.com site. For the Basic version, this deal cuts the price down to $19.47 which also includes up to 5 free federal e-files. If you used H&R Block software last year, then you can also last year’s return, along with your W-2 and 1099 forms. This is a limited time offer that will last through to the end of the month. Now on Sale Save on H&R Block At Home Basic at Amazon. You’ll find some of the best deals this week on tax software, including H&R At Home, at Amazon. Because Amazon’s sale prices change daily, or even hourly, we can’t quote any of their sale prices… All we can say is that it’s worth checking out. No coupon code needed as the sale price is reflected in the price. Try Free Try H&R Block At Home Basic free before you buy. If you’ve never used H&R Block At Home tax software before then you can try it before you buy it. Just head on over to hrblock.com and you can sign up for free and start your tax return for free (it’s similar to TurboTax’s online versions). You won’t be able to file your return until you pay for it be you’ll be able to see how it works for most of your tax return. This entry-level tax preparation software is best suited for simple tax returns and first time filers. Many taxpayers receive a W-2 that can now be imported and data automatically filled in the appropriate fields. The same applies to form 1099. Additionally H&R Block Basic can import your prior year tax details and save you time when it comes to providing personal information. You still have to verify if everything about you is the same and only indicate the changes (marital status, kids, change of work, etc), but it’s a good head start to the tax preparation process. H&R Block reviews over 350 credits and deductions to ensure you get the maximum refund and that your return is 100% accurate. If you happen to obtain a larger refund or lower liability using other online tax return preparation service, H&R Block will refund you the cost of the software you used. You will also be able to file an amended return using H&R Block without any additional costs. While preparing your taxes using H&R Block Basic you will receive step-by-step instructions and find helpful links to answer commonly asked questions. The interface and very clean and any additional information is related to the current topic. And if you still need some help, you can chat with tax experts to get you to the next step. At any point, you know what your current refund is and what else is pending to complete. Once you complete the federal portion, all relevant information is transferred to the state return. You are also eligible for 5 free federal E-files, free in-person audit support and free Earned Income Tax Credit.